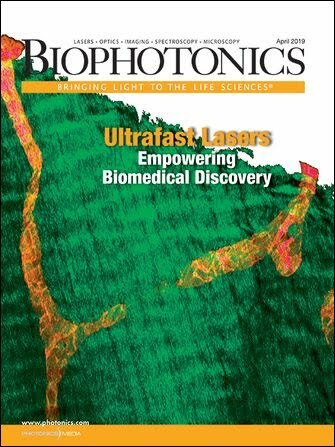 BioPhotonics has reported on many articles on green fluorescent protein, GFP, because the protein has become a standard tool for biological investigations and is being used in new discoveries all the time. GFP can be genetically engineered to be expressed with a specific protein, enabling it to reveal where proteins go and what they do in cells. It also can label a protein that scientists purposefully modify so that they can observe the results of that modification in cells. This specificity sets GFP apart from conventional fluorescent dyes such as fluorescein. It also fluoresces longer than conventional dyes, giving researchers more time to conduct experiments, and more brightly, allowing scientists to detect proteins more sensitively. GFP fluorescence can be switched on and off reversibly – a trait that has been exploited to reconstruct very high resolution optical microscopy images. Recently, Osamu Shimomura, Martin Chalfie and Roger Tsien each won one-third of the 2008 Nobel Prize in chemistry “for the discovery and development of green fluorescent protein.” The prize comes with a medal, diploma and a monetary award valued at 10 million Swedish kronor, the equivalent of 1.4 million US dollars. Born in Japan in 1928, Shimomura was about 12 km from the Nagasaki drop site of the atomic bomb during World War II. He temporarily lost his vision from the blast. “I had seen the flash of light and the strong pressure wave, and … I was soaked by black rain,” he said to Adam Smith of Nobelprize.org, the official Web site of the Nobel Foundation. Shimomura later moved to the US and joined Woods Hole Oceanographic Institute on Cape Cod, Mass. While affiliated with the institute, his research team studied the glowing jellyfish Aequorea victoria off the coast of Washington state (Figure 1). They collected tens of thousands of jellyfish each summer. Figure 1. Shown is a top-down view of a jellyfish and its organs that contain GFP (left) and a close-up of those organs (right). Photos courtesy of Steve Haddock of the Monterey Bay Aquarium Research Institute in Moss Landing, Calif.
Their initial discovery was not of GFP, but of another protein called aequorin. Inside the jellyfish, calcium causes aequorin to luminesce blue light, which stimulates GFP to fluoresce green light. It was not one of the three Nobel laureates but instead Douglas Prasher at Woods Hole who first identified that GFP could be genetically engineered in cells and used for biological studies. However, Prasher had only one grant, which ran out. As he left Woods Hole, he gave his samples and his notes to Martin Chalfie at Columbia University and Roger Tsien at the University of California, San Diego. Figure 2. 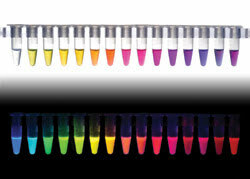 Roger Tsien’s group created colorful fluorescent protein variants such as the ones shown in these test tubes. Courtesy of Nathan C. Shaner, Paul A. Steinbach and Roger Y. Tsien. Chalfie’s group was the first to realize Prasher’s vision by expressing GFP in E. coli and C. elegans cells, while Tsien’s group studied the chemistry behind GFP fluorescence. Tsien’s group also created many colorful variants of the protein with names like grape, cherry and tomato (Figure 2). These variants have a serious purpose, too. They have enabled scientists to track more than one protein at once and to study their interactions.